Using mobile coupons for QR Code marketing / advertising. Mobile coupons let you change the offer without having to re-print. How to use a mobile coupon to increase sales. Reduce printing and waste. Deliver managable coupons, that users can share, to any device. Mobile coupons can be triggered from a 2D barcode or from a link in a mobile landing page. Mobile couponing is a trackable call-to-action. Full analytics are available. 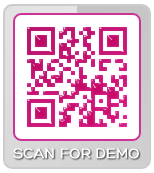 Scan the code to view a screenshot of sample mobile coupons.